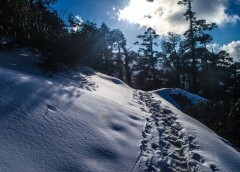 A thrilling 3-day adventure through rolling green meadows and pine tree forests, this trek to Churdhar peak showcases the pristine beauty of the lower Himalayas. During the trek, you’ll climb your way to an altitude of 11,965 feet and catch stunning views of the Shrikhand, Mahadev, Kedarnath, Badrinath and Kinner Kailash mountain ranges. Your trek will also take you through nature trails that are often covered with patches of thick snow in the months of winter. At night, you'll stay inside tents pitched at a photogenic campsite and gaze at a twinkling night sky decorated with stars. With only a few steep slopes, the trek to Churdhar takes you on a relatively easy trail, making it perfect for fit beginners as well as experienced trekkers. 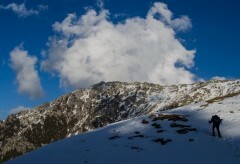 The Churdhar mountain peak, at an altitude of 12,000 feet, is the highest mountain peak in the lower Himalayas. 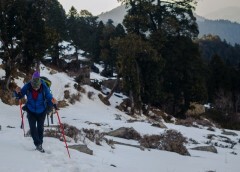 With close proximity to Chandigarh, the mountain peak has become a trekking destination for adventure enthusiasts looking to scale the incredible height on a short-itinerary. The peak is named after the Chureshwar Maharaj, who was sent away by Lord Shiva after he stuck lightning at the top of the Churdhar peak. En route, you'll also visit a temple dedicated to the Chureshwar Maharaj. • Scale the highest peak in the lower Himalayas on the Churdhar trek. • Trek through the gorgeous landscapes of the Churdhar Wildlife Sanctuary. • Catch invigorating views of surrounding Himalayan peaks. 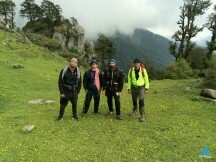 Travellers are required to adhere to the instructions of the trek leader during the Churdhar Trek. For cancellations made 7 days or more before departure of the Churdhar trek: 70% refund. For cancellations made 3-6 days before departure of the Churdhar trek: 50% refund. For cancellations made less than 3 days before departure of the Churdhar trek: No refund. 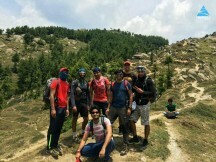 The tour operator takes utmost care to ensure safety of the travellers and shall not be held responsible for any mishap, accident or loss of life during the Churdhar Trek. If the trek is cancelled due to unforeseen circumstances, you can choose between an alternate trek and a voucher redeemable for a year. Raincoat/poncho or trekking poles can be rented for INR 110 per day, if informed at the time of booking. Arrive at the Sector 17 bus stand in Chandigarh by 05:30 hrs. Here, you'll board an SUV or Tempo Traveller and travel to the town of Nauradhar. After a 5-hr drive through the small hills of Himachal Pradesh, you'll arrive at Nauradhar and have breakfast. Your trek begins here as you undertake a 7-km stretch of a trail that will take you to Jam Nallah. After an initial steep climb, the trail will change into a gradual ascent through thick forests of pine trees. You'll reach today's destination of Jam Nallah by late afternoon. Spend some time exploring the campsite and go on short walks in the surrounding trees. In the evening, you'll gather around a bonfire and indulge in some fun games and activities. Overnight at Jam Nallah in tents. Wake up at the break of dawn and prepare for a long day of trekking to the Churdhar peak. Today's trek begins with a 5-km gradual climb to the village of Teesri. Apart from a few tea shops along the mountain ridge, Teesri has not much to offer but it is one of the windiest places on the trek to Churdhar. From Teesri, you will trek to a nearby temple where you'll take a break to eat a packed lunch. After resting at the temple for a while, you'll resume trekking to Churdhar peak and reach the summit in an hour. From the top, you'll catch a panoramic view of the Srikhand, Mahadev, Kinner Kailash and Badrinath mountain ranges. After some time admiring the sunning views of the surrounding mountains, you'll begin trekking back to Jam Nallah. You'll reach the campsite by late evening. Overnight at Jam Nallah in tents. Wake up to a steaming cup of tea and a beautiful of sunrise. After breakfast, you'll retrace your steps back to Nauradhar. 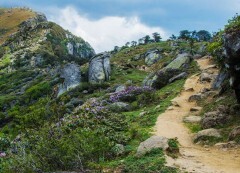 A scenic 7-km trek later, you'll reach Nauradhar by afternoon and have a packed lunch. Board shared cabs from Nauradhar that will take you back to Chandigarh by evening. Your trip ends here. Overnight at Jam Nallah in tents. Wake up at the break of dawn to a golden sunrise and hot tea. Today's meal package includes breakfast, lunch and dinner. Breakfast and dinner will be served at the campsite in Jam Nallah. Lunch may be a packed lunch served at a temple en route to Churdhar peak. You will also be served some snacks with hot soup after retiring from Churdhar. You will be accommodated in alpine tents with sleeping bags and mattresses. The campsite comes with a common kitchen/dining tent and toilet tents. Today's meal package includes breakfast and lunch. Breakfast will be served at the campsite in Jam Nallah. Lunch may be a packed lunch en route to Nauradhar. You'll reach Chandigarh by late evening. Chandigarh is well-connected to major cities of the country via flights to the Chandigarh International Airport and trains to the Chandigarh railway station. You can take local transport to travel to the bus stand from the airport or railway station.